Great to be involved in Mr & Mrs Ainsworth’s Big Day at the Wild Boar in the Lake District countryside close to Windermere & Bowness. 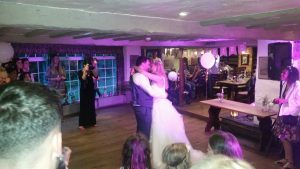 They booked wedding DJ Andy B for their evening reception as well as Andy’s Action Parties to keep the kids entertained after the wedding breakfast. Fab fun night! Congratulations Mark & Samantha! My full mobile rig consists of a top quality sound system (as appropriate for the size of your party), a selection of lighting effects to enhance the party. 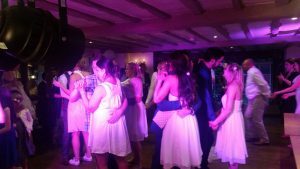 I carry a comprehensive selection of music & will be able to cater for most requests on the night, which is something I actively encourage. Beforehand, we can go through specific requests for the evening including the first dance & any other special songs (as well as any they don’t want playing!). At this point, you could prepare a whole set list (some clients ask their guests for suggestions to make up a list), which I’ll be happy to work from as required. We can have as much pre event communication as required to ensure we get it just right on the night. As well as the disco, I will also act as the host for the evening if required – introducing for example, the first dance etc. My dress code for a wedding is normally suit & tie as appropriate the occasion. I’m there all night & will fit in with how you want your evening to run. But if you do want any suggestions for timings etc, I’m more than happy to have a chat with you about it.